OUTDOOR SWIMMING POOL LUČANY NAD NISOU – The swimming pool is situated at the edge of the town surrounded by nature, very near a forest. From the terminal bus stop of the MHD no.4 in Lučany nad Nisou go towards the sawmill (pila, Jizerská dřevařská společnost) or follow a field way, go 200 meters by the main road in the direction of Jablonec nad Nisou, then turn right behind the grocery store Linda. Sunbathe on the grass or wooden surface. Parking in close distance available. The pool is 50 m long, 25 m wide and goes to 4 m in depth. Equipped with toilets, changing rooms and a refreshment stand. WATER RESERVOIR IN JABLONEC NAD NISOU – Water reservoir Mšeno is the biggest city’s water area in Central Europe and is currently primarily used for recreation. The beaches are sandy or grassy and the access to water is moderate to very steep. Beach volleyball courts in immediate proximity, as well as children’s playgrounds and concrete football, tennis and basketball pitch (all free of charge), many refreshment stands and several restaurants. In bad weather, visitors may use city sports hall, near by indoor swimming pool, tennis courts or squash courts. The surroundings of the water reservoir is ideal for cycling and hiking (nature trail) and the water reservoir is also used for fishing. LOOKOUT TOWER NISANKA - a new landmark stands on a not so significant ridge between Nová Ves and Lučany nad Nisou since 2006. After many decades a new lookout tower (altitude of 676 meters) has grown in the Jablonec nad Nisou region. It is actually a telecommunications tower but also serves tourists - a good example of how to combine pleasant with the useful. The tower is 35 meters high and the gallery is at 24 meters – so exactly at 700 m above sea level. The nice and convenient name Nisanka came up through a unique way – the visitors have chosen the name in an opinion poll. LOOKOUT TOWER ČERNÁ STUDNICE – The predecessor of the tower was a lookout at a top of a rock built in 1885. 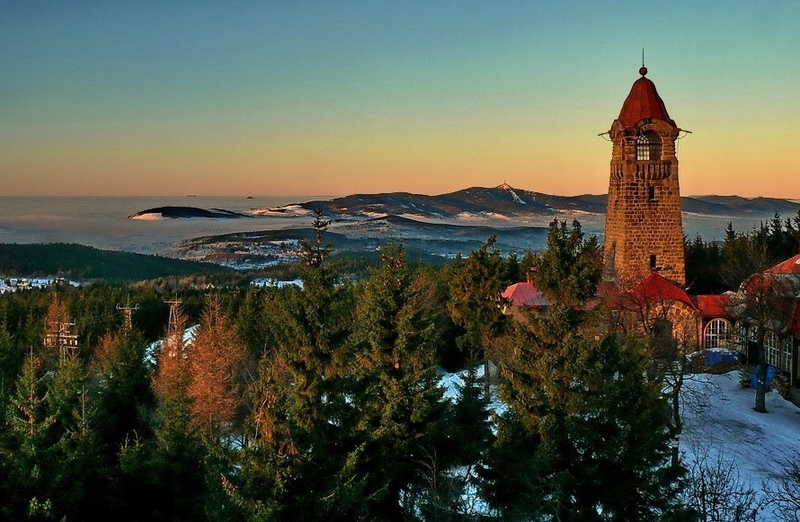 After the foundation of the Mountain Association for Jablonec nad Nisou and its surroundings in 1903, the competition for the best design for a lookout tower was announced. The winner was the architect Robert Hemmrich from Jablonec nad Nisou, he had planned for building a prestigious cottage with a lookout tower. The building began in the spring of 1904 with the guidance of architect Corazza. 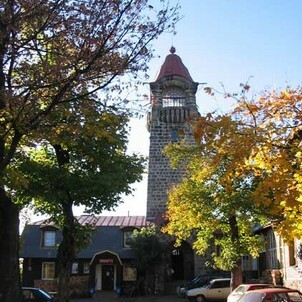 Despite the bad weather the following year the tower together with the cottage opened on August the 14th 1905.